The 2019 Toyota Sienna is a reliable people-hauler, sporty by minivan standards but built for comfort. In this preview guide, we’ll highlight what’s new for the 2019 model year then go on to explain how you can know if the Sienna is right for you and your family. Toyota has added a little more entertainment and another transmission option, but otherwise the 2019 Sienna is mostly unchanged from the 2018 model year. But these aren’t insubstantial changes. Now Amazon Alexa and Apple CarPlay come standard on all Sienna trims. Once luxury items, smartphone integration systems are becoming a must-have for drivers, and for good reason. On top of that, buyers of the Sienna SE can now check a box to get all-wheel drive instead of the Sienna’s standard front-wheel drive. That’s right. If you need to get going, or continue going, in slick or muddy conditions, all-wheel drive can help you out. The Toyota Sienna remains the only minivan in America that offers AWD. Along with that, the Sienna comes with a powerful 3.5-liter V6 engine putting out 296 horsepower and 263 pound-feet of torque. The engine is paired to an impressive 8-speed automatic transmission. All in all, the Toyota Sienna is rated to tow up to 3,500 pounds, when properly equipped. If the Sienna is starting to sound a bit more like an SUV than a minivan, you’re not alone. Before you go thinking that the Sienna is some sort of rugged, off-roading minivan, let’s steer you right. The Sienna is capable and reliable, even in bad weather, but step inside and take a drive and you’ll realize the Sienna is actually serene. This minivan is more about comfort than agility. While the Sienna SE trim has a slightly sportier suspension and larger 19-inch wheels, the SE also benefits from a quiet cabin. The Sienna has seating for 8 people on three rows, or 7 occupants if you want captain’s chairs or extra plush seating (Limited trim exclusive) on the middle row. You can get up to 117 cubic feet of storage space by folding down the third row or get 150 cubic feet by also removing the second-row seats. Add to your comfort a bundle of tech and infotainment. Keep the kids content with the Entune infotainment system, five USB ports, Bluetooth, 7-inch touch screen, Siri Eyes Free, Apple CarPlay, Amazon Alexa, smartphone-app navigation, voice controls, six-speaker sound system, and Wi-Fi hot spot. 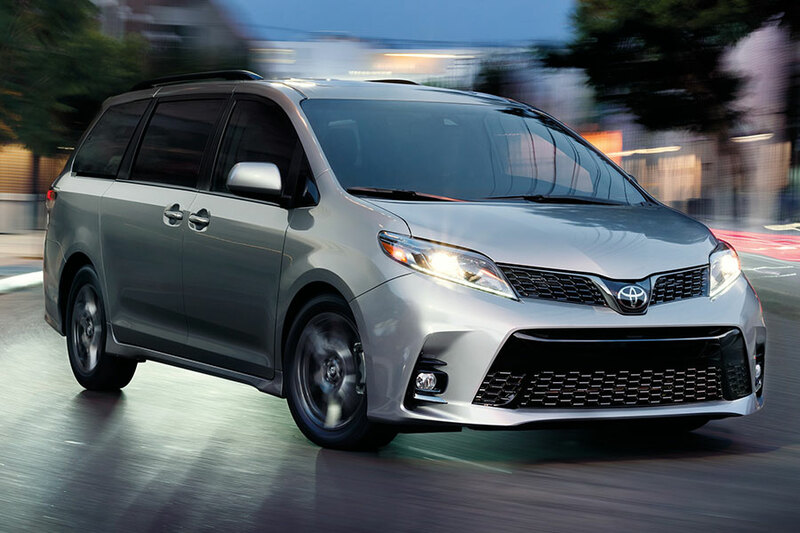 Each and every one of those features comes standard on every trim level of the Sienna. Entune is one of the better infotainment systems out there. 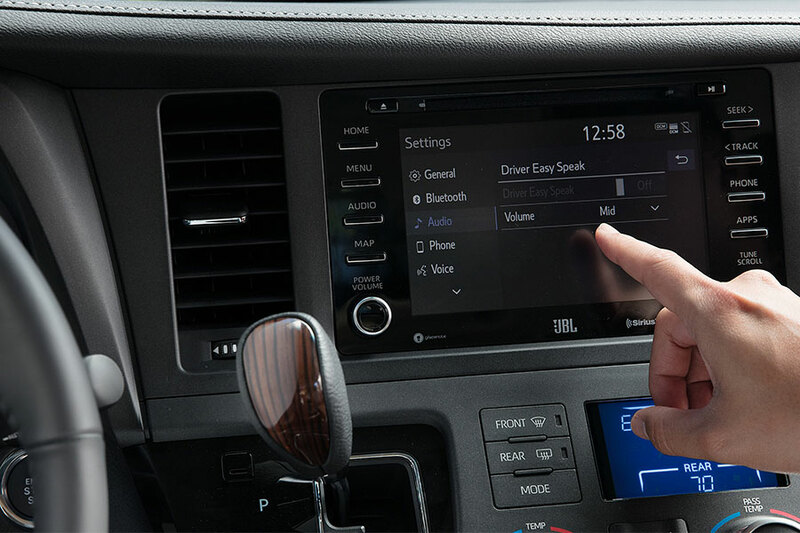 The menus make sense and in the Sienna there are a lot of physical knobs and buttons for ease of use. And Entune is pretty fast to respond. If you’re looking for a minivan that doesn’t labor down the on ramp but also cultivates a quiet, fun environment for your family, the 2019 Toyota Sienna is a great pick.